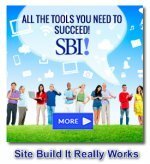 Powered by Site Build It, or Powered by SBI, is a logo you'll see on thousands of the top ranking websites online. It let's you know that the website content and web hosting of that site was built with the SBI system. All these websites have something in common that make them, more or less, successful. They are made by common people like you and I, the people who are retired, students, stay-at-home moms or simply those who want to break the 9-to-5 work routine. They all wanted to earn some extra money using their knowledge, passion, hobby, or selling products or services. They learned that by building a website that delivers great quality content they will achieve success. There are thousands of high ranking successful websites Powered by Site Build It, that were created by people who had no web design experience or professional writing experience. Why do these sites Powered by SBI attract more visitors than the majority of other sites online? What's the secret behind that particular phrase? The secret is the combination of the integrated tools and step by step Action Guide of the all-in-one business building package called Site Build It. SBI users learn a very specific business building process that begins with the right research and leads to content, traffic, preselling, and monetizing. How do I know so much about sites powered by Site Build It? I've used SBI for years, not only to build this site, but several others before it. I recommend SBI exclusively to all of my clients because I know they will have the absolute best chance of success. SBI! is a combination of process and tools (70+ modules, from research to site-building to traffic-growing) that over delivers on quality, performance, price, and most importantly, results. Created for small businesses without a web presence, SBI is also the ideal solution for those who do have a web presence, but struggle from a lack of traffic and productivity due to an outdated, ineffective, and often too expensive web hosting platform. Click here to see what's included within the SBI! system. Since 1997, SiteSell has built a world-wide reputation on the Net and achieved exponential growth in sales each year due to the industry-leading product offering, SBI!. Do It Yourself with some Help - Coaching! Are you a true beginner like I was? Never created a web page or understanding internet lingo such as bandwidth, keyword research, cpanel, FTP space, search engine optimization, link building, or site-marketing? Don't worry about it! 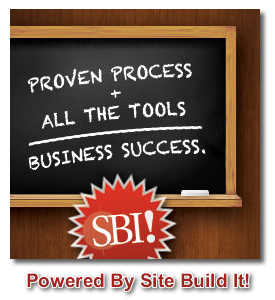 SBI helps you with each and every step of the planning and building website creation process. The keep the technical aspects down to the minimum so you can concentrate on what's most important - your business! Powered by Site Build It? Perfect Preparation - Brainstorm It! Version 3.0, Search It!, Niche Choose It! Monetization - Monetize It!, Infin It!